The GSBC holds several special events, including our day-long Annual Seminar and late-night RPL Lock-In—where genealogists can attend talks on a variety of subjects, collaborate on problems, and receive one-on-one research assistance. Additional event fee may apply. Discount for GSBC members. GSBC Members and others receive complimentary on-site consultation with our Genealogy Consultants at the Bolger Heritage Center. All our consultants can help beginners through experienced researchers, guide you in the use of the Genealogy and Local History Reference collections at the Bolger Heritage Center, and help you break through your brick-walls. If you need assistance with a specific area not listed, contact us and we will match you as best we can with an expert in that area. To make an appointment, email contact@njgsbc.org to reserve your consultation window. America’s doors were open to all before the Civil War, with few restrictions. Afterwards, the laws began tightening, with exclusions, quotas, even required visas. How did the immigration laws affect your ancestors who immigrated after the Civil War? What hoops did they have to jump through to enter America’s “golden door”? In celebration of Ridgewood’s 125th anniversary, Local Historians Peggy Norris and Joe Suplicki will provide a slide lecture focused on the critical years between 1865 and 1876. 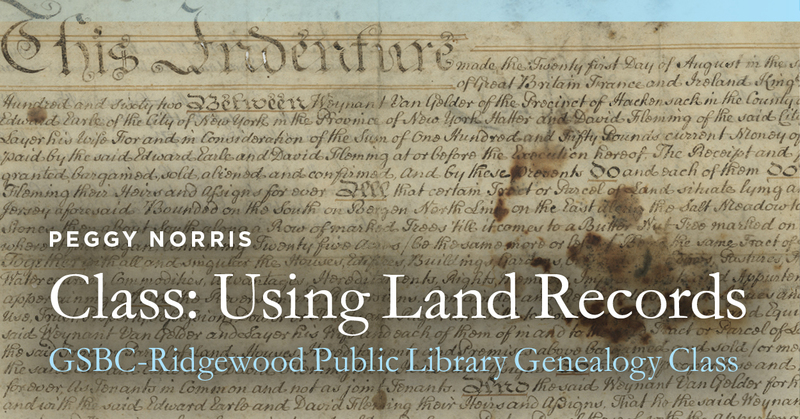 Using documents, maps, and historic panoramic photos taken of Ridgewood, you’ll see how Ridgewood transformed from a farm to a suburb. North Jersey Rapid Transit Company trolley line existed from 1910 to 1928 and ran from East Paterson to Suffern traveling through Fair Lawn, Glen Rock, Ridgewood, Ho-Ho-Kus, Waldwick, Allendale, Ramsey and Mahwah. Walk the 15-mile length of the former trolley line with Phil Jaeger as he describes the company's operation and takes us on a ride covering the route as it appeared a century ago as contrasted with the route as it appears today.